Wow! I have been really busy BUT I wanted to come on to let you all know that I am officially in love with Istanbul. All it took was some good shopping, new friends and lots of great food. Right now I am getting home from work at around eleven every night because we are hosting a conference at our office but next week it should be back to normal and I can start having lots of deep feelings and start writing long rambling posts again! The escalators, walkways and revolving doors are energy efficient so they go really slow until they sense that someone is actually using them and then they go the normal speed. I really like this. Alright? It’s Feraz here with a special guest entry! I thought I’d tell you all about the scene here with Turkish Football. It has been very nice for me to live in a country again where football is the main sport so I’ve been taking advantage of that and have gone to a couple of matches already. First off, Sumeera and I went to a World Cup qualifying match on our second day in Istanbul – we saw Spain play Turkey at the Galatasaray ground, Ali Sami Yen Stadium. This match was sweet as hell! The only bad thing was that Turkey ended up losing in the last minute 2-1 after leading most of the match 1-0. However, me and Sumeera still really enjoyed ourselves as it was end-to-end stuff until the final whistle blew. The atmosphere inside the stadium was very good – I think b/c there’s no alcohol in the grounds here you don’t have to worry about it getting violent or anything like that. 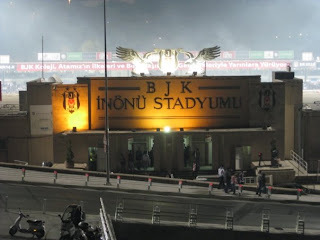 Yesterday I went to a Besiktas match. They played the second leg of a Turkish Cup match, after having won the first leg 3-1. I was really excited about this game when I realized that tickets were only 20 TL (about $12-13) which meant that I could actually afford to go! I think I’ve fallen in love with Besiktas. They are the closest team to where we live in Istanbul – so close in fact that it took me about 10 minutes to walk to the game. And walking to the game was cool as hell man. I felt like a proper footy fan after all those years of armchair supporting. The main reason which I like Besiktas is that I feel like they’re the Turkish equivalent of Liverpool. Hence, just like Liverpool supporters, Besiktas supporters are known to be very loud and enthusiastic. In fact they have the world record! When Besiktas beat Liverpool in the Champions League last year the noise got up to 132 decibels (we won the return game 8-0 BTW). So…needless to say I was pretty damn excited about this one. When I took my seat I just had to take a couple of minutes to take it all in. The ground wasn’t even close to being full (for a number of reasons which I can’t be bothered to get into) but what a view! In the background you’ve got the Bosphorus, you can see all the way to the Asian side, then there’s a mosque right next to the stadium, and the open sky above, and massive hill on one side where fans can just about watch the match for free if they can’t get into the ground (I did this one day too). In fact, Pele has called the Inonu Stadium the most beautiful stadium in the world – I can see where he’s coming from there. When the match got underway the chanting was immense. One side of the ground chants to the other side who then respond, and then it keeps on going back and forth until another chant starts up and then it begins all over again! Worrrd. I could get used to this. Overall, I’ve been very pleased with the football scene here in Turkey. People who are into football also know all about the English league and it’s easy to watch matches and keep up to date with what’s going on in the rest of Europe. Besiktas are one point off the top of the Turkish Super Liga so I hope I’ll get to experience what it’s like for them to win the league. Before that happens though I’m going to try and go to a couple more games. Next up should be the local derby with Fenerbahce – now that one will DEFINITELY be jammed. PS: Another good thing about Turkish football is being able to pray at the stadiums. At the Besiktas match that I went to there were a bunch of ppl praying maghrib at halftime at a conveniently located corner which faced the qibla. Nice. Today was such an amazing day but I will try to blog about this weekend all in one go early next week. And after my last text-heavy post I thought you all might enjoy some laid back picture viewing time. Here are pictures from our time in the UK and some pictures of our life in Turkey from when Erik and Krishna came to visit. Enjoy! Erik and Krishna Come to Visit Turkey! This is a picture of me from today. Evidently people in Istanbul don’t wear stickers on their faces but they laugh a lot when they see someone wearing one! Today I woke up feeling sick with a closed up throat and a terrible headache. I tried every remedy I knew from eating brownies to watching trash TV with no success. Seeing as being home wasn’t going to help the situation I decided to go exploring in hopes that the fresh Bosphorus air would help fix me right up. My exploring led me to a much more residential part of the area. It was nice to see normal Turkish people instead of the masses of chic people and tourists on Istikal street. I found myself smiling at the shop owners, nodding my head like someone who is familiar to the area, who may have lived there her whole life. But then I am forced to buy something at one of the shops and the shop owner quickly realizes I don’t know Turkish. Suddenly, my cover is blown and I am just a foreigner again. As I was walk out of the shop, I began drafting a letter to Rosetta Stone in my head. This is what it looked like but I think in my head the font was Courier and not Times New Roman. I would like to strongly urge you to create a Rosetta Stone for Turkish that will teach things one might actually need to know in a foreign country. In almost one month in Turkey I still have not had the opportunity to say, “The boy is under the table.” or “The dog is jumping.” In fact, the dogs in Turkey never jump! They just lay lifeless outside my front door. In say, some time in the first five or so lessons, I would recommend teaching things like, “That is too expensive!” or “You can’t be serious!” That would end around 90% of the conversations I have. Also, “Do you know that Obama is a close personal friend?” might come in helpful sometimes. I sincerely hope that you will consider these suggestions. To get the bad taste of being a foreigner out of my mouth I walked down the steep, steep road to the Bosporus and had one of the best moments of my life. I was walking along side the Bosporus and the sun was hitting the water in such a way that even with my sunglasses on, I could see millions of diamonds. The heat felt so good in contrast to the breeze coming from the water. I could hear the Imam leading Friday prayer at the Mosque beside the water and I could feel the words in every part of my body. I hope I can remember this moment for always. Of course I will remember it happened, but I hope I can remember it. The feeling of hope and of promise that one day I will stand before God. Since I have been in Turkey I am almost becoming frustrated with how much time I spend thinking about God. I just can’t get Him out of my head! Maybe it is all the mosques everywhere or maybe it is because I spend so much time with myself but somehow God is never more than a thought or a feeling away. In Ann Arbor I got so good at not thinking about God. Even when I prayed I was barely thinking about Him. Instead there was always somebody around, always somebody to talk to or go out with or meet for dinner. But now here in Istanbul, I am always walking towards Him, always thinking about Him. Ghandi once said “There are people in the world so hungry that God can not appear to them except in the form of bread.” I think that for so long I filled my life with so, so many people that God could not appear to me. I was so consumed by the creation that I lost sight of the Creator. It became so, that God could only appear to me in the depths of my loneliness. And now days, I don’t feel so lonely. As I let new people enter my life, as I reconnect with old friends, I find that they don’t have to consume me. A large part of my motivation for coming to Turkey was so that I could grow stronger. So that I could challenge myself to adapt in a world where I didn’t know anyone and where I didn’t know the language or culture. But mostly so I could learn about the strength of my own two feet. What I didn’t realize was that at times it would be incredibly hard and painful. As I finally find myself emerging on the other side, I am thankful for the challenges that Istanbul first presented and those that it still will. Already I feel the stirrings of someone who is stronger, more confident and more ready to face this very, very big world. 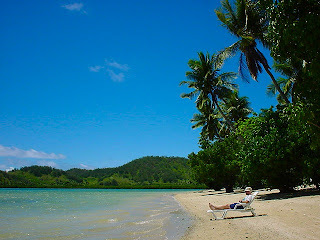 Today at work, after completing a test at the end of a training, I was given a list and it said: “As a reward for your hard work, click on your ideal travel location below.” After I picked Nadi, Fiji (pictured to the right), a message popped up and said, “In your dreams! You’re needed back at work!” So cheeky!